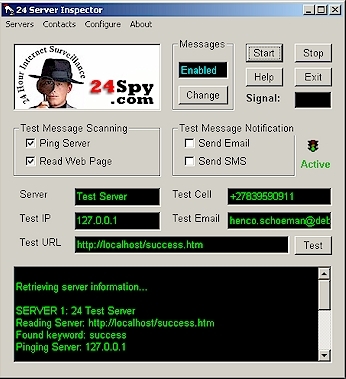 These are some screen shots of the 24Server Inspector software. Detailed information about the program is provided in a Microsoft Word file. Choose 'Save As' from the prompt window and open the file on your computer. The program has various messaging features that have not been described on this website. 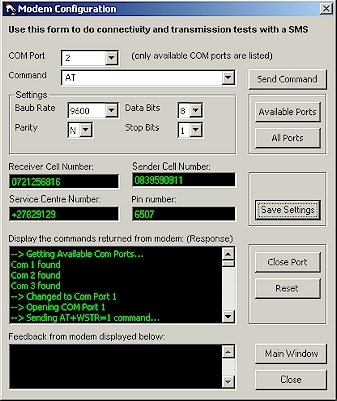 For example, it can be interfaced to other applications to send SMS messages. Your own advertisement can be included in each message, turning the software into a powerful marketing tool. Until further notice the 24Server Inspector application (software) is only supported in South Africa. Services provided on this website is supported world-wide.